The Adventures of Rama are incidents derived from the Ramayana, the ancient Hindu tale that was transmitted orally for centuries, captured into magnificent painted texts by the Mughal ateliers who translated them into Persian. First published in 1983 by the Freer Gallery of Art, this edition by Mapin is newly designed, enriched with details from the illustrations in the book. 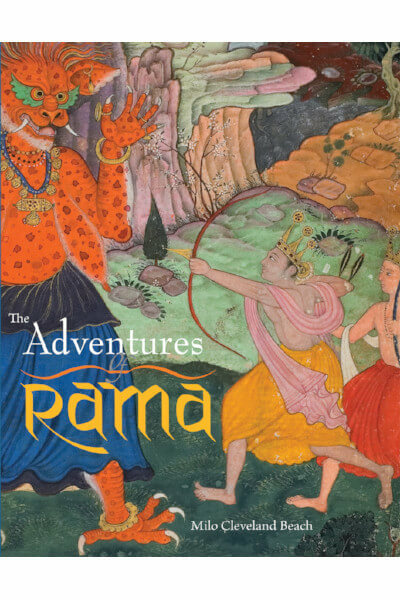 The Adventures of Rama are incidents derived from the Ramayana, the ancient Hindu tale that was transmitted orally for centuries, captured into magnificent painted texts by the Mughal ateliers who translated them into Persian. These incidents have been retold here and lavishly illustrated using original paintings from a 16th-century Mughal manuscript in Persian, ordered by Emperor Akbar for the commander-in-chief of the imperial army, Abd-ar-Rahim. The enthralling stories that string the epic together capture the imagination of young readers and adults alike. To rid the world of the evil ten-headed Ravana, the Hindu god Vishnu appears on Earth as a heroic prince, Rama. The devotion of his brother Lakshman, his marriage to the beautiful Sita, and encounters with demons, giants, sages, and holy men, form favourite episodes, familiar to any Hindu child. These stories conclude with Rama’s efforts to rescue the kidnapped Sita, aided by Hanuman, leader of an army of monkeys. First published in 1983 by the Freer Gallery of Art, this edition by Mapin is newly designed, enriched with details from the illustrations in the book.